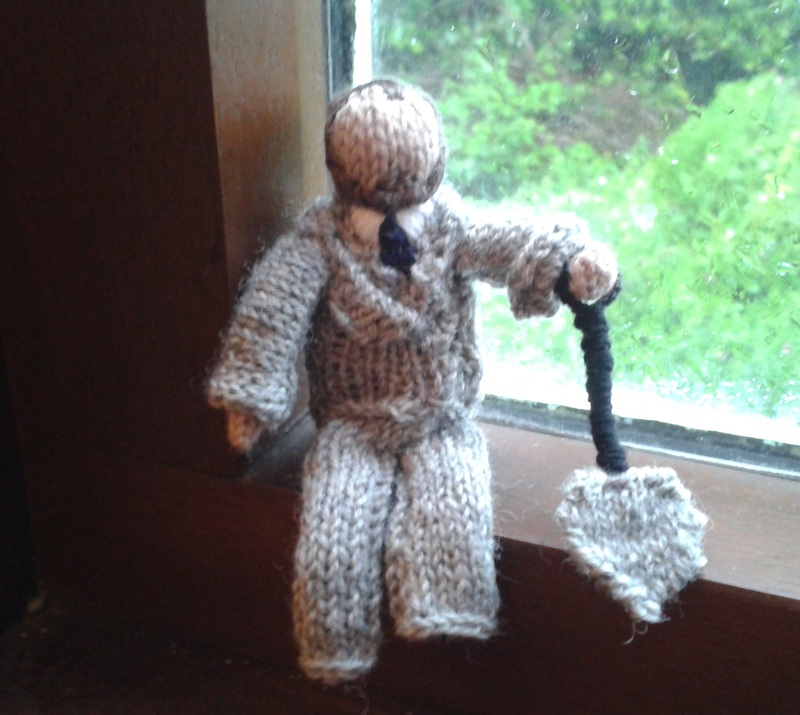 As part of my on-going knitted authors challenge, I thought I’d knit him for his birthday in a nice tweed suit. The reason he’s got a shovel is because today, we’ll be meeting him at the cemetery gates. Thomas Hardy is well-loved as the pen-master of misery and rural decline, but it’s not widely known that as well as being a renowned author, he was a trained architect. He resided for a while in London, where, in the mid 1860s, he was put in charge of the excavation of the graveyard of the old church at St Pancras. It’s destruction was deemed necessary in order to make way for an extension of the Midland Railway to a new terminus at St Pancras station. 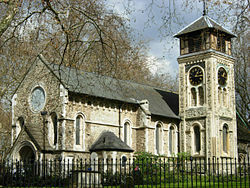 St Pancras Old Church is famed for being mentioned by name in Dickens’ ‘A Tale of Two Cities‘ published in 1959. The Beatles were photographed there in 1968 to promote their single ‘Hey Jude and the video for Lena Lovich’s 1979 hit ‘Bird Song’ was filmed here. More recently, Sam Smith recorded a live version of ‘I’ve told you now’ for the deluxe edition of his 2013 album ‘In the Lonely Hour’. Clearly it’s the coolest Holy hangout in town. St Pancras Old Church, sanctuary to the stars. It seems quite fitting that when he wasn’t writing, Hardy could be found down at the local church yard digging up other people’s mortal remains so they could be relocated in a safer resting place because they lay in the path of the unstoppable wheels of industrial progress. Still, I’m sure he’d have approved of his tree, walled in by death on all sides. As far as melancholic tributes go, that’d be pretty tough to beat. 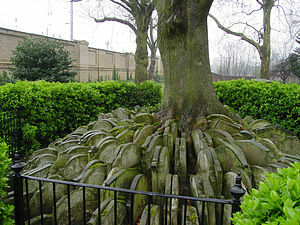 The Hardy Tree, growing between many of the gravestones moved while Hardy was excavating there. ← Dammit, Lovelace. You’ve ruined the whole book. I love St Pancras Old Church, it’s where Mary Shelley’s mum is buried, and her and Percy used to meet at her grave for romantic chats during their courtship. The more I read about it the more popular it seems, and most definitely the place to be seen, like the religious equivalent of Carnaby Street in 1967.